Detectives from the Sacramento County Sheriff's Department is seeking assistance in identifying two suspects wanted for a convenience store robbery. 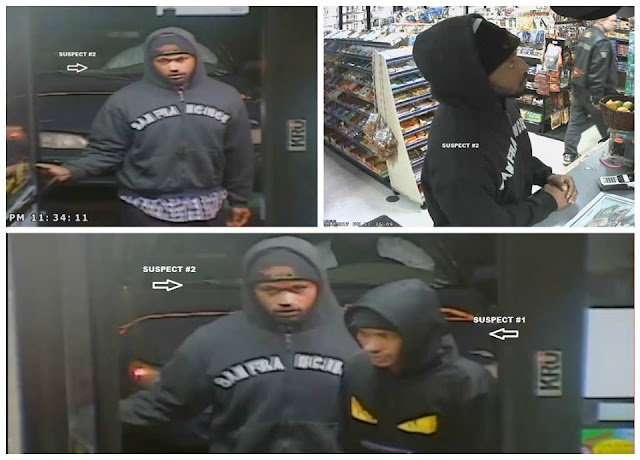 Shortly after 11:30 p.m. on Wednesday, February 8, the suspects entered the Stop and Shop convenience store located in the 4300 block of Madison Avenue in Sacramento. One of the suspects was armed with a handgun, and demanded money from the clerk. Both suspects went behind the counter and took money and liquor. The suspects fled on foot with an undisclosed amount of money. The first suspect (above right) is described as a black male adult, 20’s, approximately 5’8”, 165 pounds, wearing a black hooded jacket with yellow eyes on the front, jeans, and a black beanie. His accomplice is described as a black male adult, 20’s, 6’, 200 pounds, wearing a black hooded sweatshirt with “San Francisco” in white writing, plaid shirt underneath, tan pants, and a black beanie.